It has been a while since I have posted regularly. That is not to say that I haven’t been indulging in my two favorite hobbies: watching movies/TV shows and reading. Au contraire, I have been very busy in both activities, but I haven’t found much to say about the movies I have watched. Today I’m going to give you brief glimpses into the impressions those movies I have seen lately have made. I’m glad that the new season of Games of Thrones is back and that the characters whose stories were left untold in season 5 are back. Some of those characters are the Stark siblings who have undergone terrible tragedies during the show. I am excited about how Jon Snow’s character has been handled, but it makes me think that there is something true about those conspiracy theories circling online about Jon Snow being part Stark, part Targaeryen. Also, I have been busy watching the first and only season of the Starz show The White Queen, which encompasses the first three books of the series by Philippa Gregory on the War of the Roses. 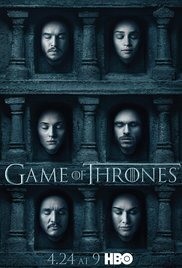 Great performances and deadly serious power struggles make this show the real life Games of Thrones. I think it’s a darn shame that there weren’t more seasons to watch. 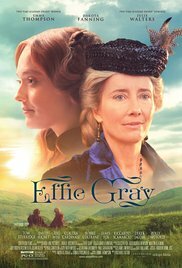 Effie Gray (♦♦♦): with a solid screenplay written by Emma Thompson, the Pre-Raphaelite movement as background, the undeniable growing attraction between Effie and Pre-Raphaelite painter John Everett Millais, and Effie Gray being among the first (if not the first) woman to seek a divorce in England from her famous spouse—art critic John Ruskin—, Effie Gray had many things working for it, but it didn’t deliver on its promise. 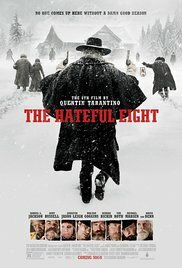 The Hateful Eight (♦♦♦½): I like Quentin Tarantino movies, but sometimes they can go overboard with the language and the gore. In this one there is not too much use of the N word, but it is as bloody as any horror movie can get. There are positive things working for it though, the plot and execution are very interesting. It is also good fun as well. And the ensemble cast just makes it worthwhile. In a year full of lackluster productions, The Hateful Eight deserves an honorable mention. Shelter (♦♦♦): In the streets of New York City, two homeless persons fall in love and look for redemption, one by cleaning up from her drug addiction, the other, by helping her regain her footing. Directed by Paul Bettany, this film is well acted by both Jennifer Connelly and Anthony Mackie. The redemption process is at times depleting and painful to watch, but it is worth it. Too bad the good performances weren’t enough to lift this movie to a must-see category. 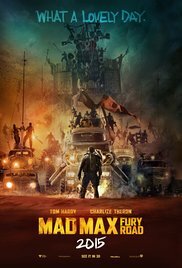 Mad Max: Fury Road (♦♦♦): If you watched this year’s Oscars, then you couldn’t have missed the deluge of awards this movie earned in the technical categories. I agree with those awards. Fury Road was an over-the-top extravaganza that didn’t score too many points by virtue of its performances (though they were very good), but by stressing the technical achievements of its very creative crew. 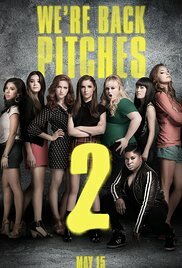 Pitch Perfect 2 (♦♦♦♦): I’m not sure what the target audience is for this movie…High schoolers? College students? I don’t know, but despite me being not its intended audience I enjoyed it a great deal, not so much for its semi-crude humor but for the very creative a capella musical arrangements. I always enjoy music in movies. Wow, it is like you had a movie slump the way I had a reading slump. But so good to find a post from you. Maybe a book review next? I only watched one movie last week, the adaptation of the 1962 thriller Seven Days in May that I read a while back. It was good, especially Henry Fonda as President. If only I could read as fast as you, Judy...Exodus is taking me forever and the promises don't wait, so I don't know what to do; I seem to be reading a book a month this year. Maybe I'll watch that adaptation when I finish watching the 2015 movies releases I'm interested in. Interesting snapshots. I never watched The White Queen although I read and enjoyed all the books. Maybe I'll get to it one of these days. I, too, am enjoying this season of Game of Thrones. I've long been a proponent of the R + L = J theory, so I'll be very shocked if Jon does not turn out to be half Stark, half Targaryen. I've heard so many good things about Mad Max. It just didn't sound like something I would enjoy watching, but maybe I should give it a chance. Yes, I would be surprised too if that isn't the case with Jon Snow. I was surprised by Mad Max. I'm not really into the post apocalyptic genre, but I enjoyed it more than I thought I would. It's just mindless entertainment, remember that. I've not seen all of these but I agree with you with the ones I have in terms of rating. I didn't love Max Mad or The Hateful Eight - I thought they had good and bad points but worth watching. I loved The White Queen series and I am so pleased that Game of Thrones is back too - from the hints that have been dropped in the books, I've read so far, then I think those rumours about Jon Snow are true. I wonder how the writers are going to spin the story to surprise everyone. Connelly was homeless and a drug addict. The movie had the feel of House of Sand and Fog, which is beyond great, but Shelter fell short and I can't pinpoint why.